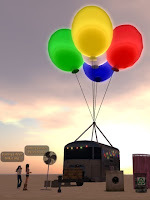 In Real Life, there is a big art event "Burning Man", and there is a similler event in SL also! I was so exciting when I visit to there last year, and this year, I won with lottely to get percel for it! Then, I started to think about concept of the main artwork with my friend Emily. You can get many great objects at there for free. Oh, then, it needs drink vendor..ok..
please try it at my percel!